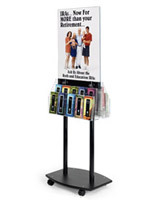 Poster Display Racks - These poster display racks hold two 22"w x 28"h posters for double-sided viewing and the poster display stands 67" tall. 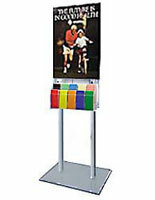 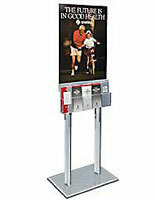 The base dimensions of this unit are 24"w x 18"d. This poster stand moves freely on (4) locking casters. 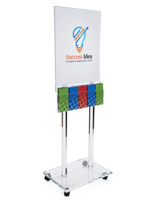 Easy to assemble, and all hardware is provided. 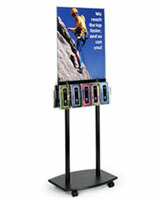 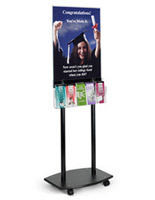 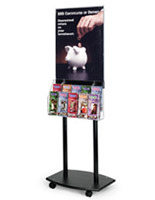 This poster rack has a 10-pocket brochure attachment with sturdy, removable peg dividers that can be configured to hold standard 4" brochures or 8 1/2" wide letter size literature.